Stream 2) one year; exceptionally, longer duration may be considered. Stream 1) events or small projects: applicant must submit a request at least one month prior to the start date of the event or the project. Stream 2) there are three deadlines/year: January 15; May 15 and September 15. The evaluation process may take up to two months from the deadline. Stream 1) evaluated by the HBHL management. Stream 2) evaluated by external reviewers under the direction of the HBHL Research Management Committee. A list of potential reviewers is required. The KM application form is uploaded on-line as PDF. 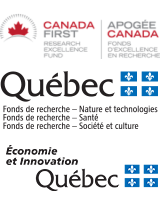 The Healthy Brains for Healthy Lives (HBHL) initiative is a high profile, high priority multidisciplinary and cross-sectoral initiative located at McGill University made possible with support from the Canada First Research Excellence Fund (CFREF). The HBHL Strategic Research Plan outlines the vision, deliverables, and overall goals of the initiative, and the research priorities of its four research themes. HBHL’s Knowledge Mobilization Program will support projects that facilitate and accelerate the integration of neuroscience advancements into policies or public awareness activities aligned with HBHL’s vision to reduce the human and socio-economic burden of psychiatric and neurological illnesses, and improve the mental health, quality of life, and productivity of Canadians and people around the world. Promote clinical, health services, and policy translation of HBHL knowledge to address health needs of global communities. Applicant: The applicant must be a McGill faculty member who is eligible to hold Tri-Agency research funding. Co-applicants: Teams involving co-applicants from McGill University or our CFREF partner institutions (Western University, Université de Montréal or University of British Columbia) are encouraged. All co-applicants must be eligible to hold Tri-Agency research funding. Collaborators or other partners: We also encourage participation from collaborators from non-partner institutions, industrial partners, or foundations. Such partners can provide letters of support to describe their participation in the project. However, CFREF funds may NOT be transferred to non-partner institutions, industrial partners, or foundations. Anyone who is included in the budget for salary compensation cannot at the same time be a collaborator (i.e. students, postdocs, research associates). CFREF funds may be awarded only to applicants from McGill University. Funds may be transferred to co-applicants from eligible partner institutions (Western, UdeM, UBC). Eligible expenses include direct costs, such as salary and benefits for research personnel, supplies, travel, small equipment, workshops, computers, and services. All expenses must adhere to guidelines in the CFREF Administration Guide. Contribution to HBHL deliverables (20%): Does the project make major advances pertaining to HBHL deliverables, in particular the Canadian Framework for Brain Health? Is the project closely aligned with the research priorities of one or more of the HBHL research themes? Proposed activities (50%): Is the rationale for the proposed activities well elaborated? Are the objectives of the proposed activities clear and attainable? Do the proposed activities advance the development, translation, mobilization and/or policy use of HBHL-funded and related research to improve the lives of Canadians and accelerate Canadian innovation, productivity and economic competitiveness? Will the project lead to the development of policy or public awareness aligned with HBHL's goals and research priorities? Does the project promulgate Open Science and data sharing principles? Is there a clear and feasible implementation plan (e.g. activities, timeliness, and milestones)? Are the anticipated benefits well elaborated? Who will benefit from the proposed activities? Is the need for HBHL funding well explained? Leadership and/or team (20%): Is the leadership qualified to manage and deliver the proposed objectives? Is there a commitment to tracking milestones and deliverables linked with the project and providing all relevant information back to HBHL administration for reporting purposes? Are appropriate partnerships set up that define partner roles and cash or in-kind contributions? Proposed expenses (10%): Do the expenditures appear reasonable and appropriate for the proposed activities? Do all the expenses adhere to guidelines in the CFREF Administration Guide? All applicants will be notified by email of the results of their application. Successful applicants will be sent a Notice of Award. It is the Applicant’s responsibility to complete the Acceptance of Award form and other required documents including the McGill’s Office of Sponsored Research (OSR) checklist by the deadline.